'In a time when recording contracts are rare enough to be an endangered species, I feel both lucky and privileged to be working further with EMI Classics, my loyal and brave partners of more than 30 years'. 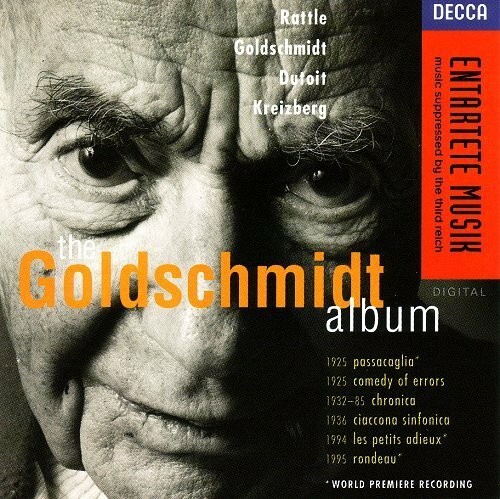 One of Simon Rattle's truly ground-breaking projects was his 1995 recordings with the City of Birmingham Symphony Orchestra of the Passacaglia, op, 4 (1925) and Ciaconna sinfonica (1936) by the exiled German composer Berthold Goldschmidt (1903-1996). The only problem is these recordings were not made by Rattle's loyal and brave partners of more than 30 year. The conductor was specially released from his exclusive EMI contract to record for more adventurous rival Decca two contributions to their Goldschmidt Album. This appeared as part of Decca's visionary Entartete Musik, a series that truly added to the depth and breadth of the recorded repertoire. Although the Goldschmidt Album is deleted it is still available as an MP3 download and should not be missed. What makes this story much more than an interesting anecdote is that Simon Rattle once literally saved Berthold Goldschmidt's life. Doubtless the senior management of EMI are hoping the conductor can now do the same for their troubled company. Read how Sir Simon revived Berthold Goldschmidt here. should have been "almost 20 years with Labatt breweries , Spews..."
somehow more appropriate.BTW,seriously, is anyone not knighted these days? 'Is anyone not knighted these days? Apologies for being pedantic - but reading your ongoing annoyances over linguistic/typographical mis-use let me parade one of my own: "reaches a crescendo" is wrong. There could be a crescendo in the amount of PR re Rattle etc which would reach a climax with this announcement. There I feel better now! Nick, please do not apologise. Corrections are always welcome here. Like everyone else I make quite a few mistakes. The check and balance provided by readers is as valuable as the original posts. Couldn't agree more. That Goldschmidt Album was a marvellous addition to the Entartete discography. That said, the EMI recordings of Szymanowski were equally welcome. Sad, then, that the Berlin period has been dominated by Brahms, Haydn, Beethoven and Mahler (none of whom are in need of such support). Surely those recordings should be used to pay for the more adventurous repertoire? Simon Rattle's new EMI contract continues the trend with a complete Nutcracker. Having said that it also includes a Schoenberg disc with Begleitungsmusik zu einer Lichtspielszene. I wonder if I might use this as an excuse to mention a composer far more forgotten: Douglas Coates. Well, actually, unknown at least to me until yesterday when I checked out the new entries in the Naxos Music Library and spotted a Divine Arts disc of two concert performances: a magnificent one of Campoli playing the Moeran concerto with Boult and the BBCSO in 1954, and the other of Colin Sauer playing Coates concerto with the BBCNSO and Groves in 1951. The disc is worth knowing about for the Moeran/Campoli, a bit of a stunner, but I enjoyed the Coates greatly on first hearing and shall be going back to it. Thus far, I've found no information about him whatever other than that he destroyed the score of the concerto as a not overly helpful protest against the BBC's modernism.